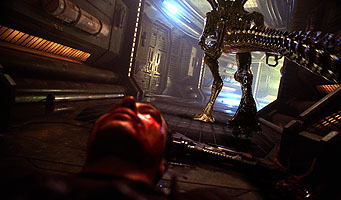 The wire frame representation of the CG alien is presented above, as well as the final shot of the alien composited into the background plate. 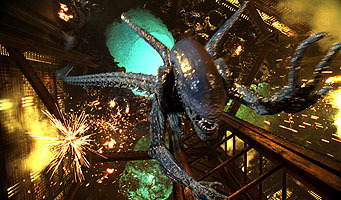 The CG alien sequences were handled by the New York office of Blue Sky|VIFX. The top left photo is a screenshot of a wireframe preview of the sequence. The right photo is a soft shaded, fast render of the CG alien in the scene. The bottom graphic is a final still from the film, with final lighting, textures and motion blur rendering.